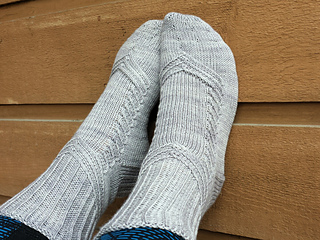 Virrat (Streams) sock pattern was exclusive to the registered racers of Tour-de-Sock 2015 until the end of January 2016. It was the pattern of the first stage starting June 1st, 2015. The pattern is now available for everyone free of charge. Please note that the sizing is quite generous so if you hesitate between two sizes, do choose the smaller one. Do not mind the hole that is formed in the beginning, the instructions will tell you how to close it during the finishing steps.